You can see and feel its high quality the moment you put it on. This handsome vest will become a staple of your wardrobe and easily match with any dress pants, dress shirt, suit, and tuxedo. It's a versatile vest that is suitable for many occasions. The fabric of 65%polyester and 35%viscose is soft and comfortable. The back of the vest is made of 100%polyester lining which make it light and fashionable. This men's formal vest is a wonderful choice for all seasons. 34R: Back Length:21.1",1/2Chest:18.3",1/2Waist:17.1",1/2 Bottom:18.3",Single Shoulder:3.7"
36R: Back Length:21.3",1/2Chest:19.1",1/2Waist:17.9",1/2 Bottom:19.1",Single Shoulder:3.8"
38R: Back Length:21.6",1/2Chest:19.9",1/2Waist:18.7",1/2 Bottom:19.9",Single Shoulder:3.9"
40R: Back Length:21.8",1/2Chest:20.7",1/2Waist:19.5",1/2 Bottom:20.7",Single Shoulder:4.0"
42R: Back Length:22.0",1/2Chest:21.5",1/2Waist:20.3",1/2 Bottom:21.5",Single Shoulder:4.1"
44R: Back Length:22.3",1/2Chest:22.2",1/2Waist:21.1",1/2 Bottom:22.2",Single Shoulder:4.2"
46R: Back Length:22.5",1/2Chest:23.0",1/2Waist:21.9",1/2 Bottom:23.0",Single Shoulder:4.3"
48R: Back Length:22.8",1/2Chest:23.8",1/2Waist:22.6",1/2 Bottom:23.8",Single Shoulder:4.4"
50R: Back Length:23.0",1/2Chest:24.6",1/2Waist:23.4",1/2 Bottom:24.6",Single Shoulder:4.5"
52R: Back Length:23.2",1/2Chest:25.4",1/2Waist:24.2",1/2 Bottom:25.4",Single Shoulder:4.6"
54R: Back Length:23.5",1/2Chest:26.2",1/2Waist:25.0",1/2 Bottom:26.2",Single Shoulder:4.7"
56R: Back Length:23.7",1/2Chest:27.0",1/2Waist:25.8",1/2 Bottom:27.0",Single Shoulder:4.8"
58R: Back Length:23.9",1/2Chest:27.8",1/2Waist:26.6",1/2 Bottom:27.8",Single Shoulder:4.9"
60R: Back Length:24.2",1/2Chest:28.5",1/2Waist:27.4",1/2 Bottom:28.5",Single Shoulder:5.0"
Dry clean only. Sold and shipped by US seller, fast shipping. Feature: 5 button, 2 pockets, V neck and sleeveless, collarless, classic fit, solid color, adjustable back-belt. Notice: Please check size information before ordering to make sure your measurement. Color may be little different due to monitor. Thank you for your understanding. 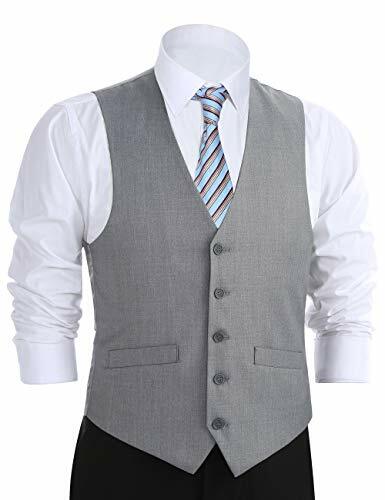 Occasion: The fashionable men's formal button down vest match with any dress shirt, suit, tuxedo and is suitable for formal dress occasions, business or work, wedding, date, ball or graduation. If you have any questions about this product by Chama, contact us by completing and submitting the form below. If you are looking for a specif part number, please include it with your message.